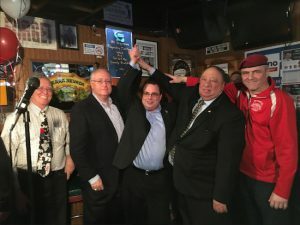 Bob Capano, candidate for Brooklyn’s 43rd Council District (Bay Ridge, Dyker Heights, Bath Beach, Bensonhurst) has been endorsed by the Kings County GOP Coalition. The group is made up of Brooklyn Republican state committee members, community leaders and grass-roots GOP activists. Capano, who manages a Gristedes supermarket in Manhattan and teaches political science at John Jay College, is one of three Republicans seeking the City Council seat held by Vincent Gentile, who is leaving due to term limits. The other candidates in the crowded field are John Quaglione and Liam McCabe. The Democratic challengers are Justin Brannan, Rev. Khader El-Yateem, Kevin Peter Carroll and Nancy Tong. “Bob Capano is our candidate in this race. He is the Republican that best represents the change our voters yearn for today,” Dany Esquilin, chairman of the Kings County GOP Coalition said. “Bob is not part of the status quo political establishment. Unlike his Republican primary opponents, who have spent their careers working for elected officials and living off the taxpayers’ dime, Bob has real-world experience managing a business and teaching high school and college students. As ‘citizen Capano,’ he has already been on the front lines fighting Mayor [Bill] de Blasio’s far-left policies. He offers the new leadership that Brooklyn Republicans so desperately need. “I am grateful for the support of Chairman Esquilin and the Kings County GOP Coalition. Their Coalition represents grass-roots Republicans who are looking for leaders who will fight for our shared values and are not part of the business as usual crowd that is running our city into the ground,” said Capano. The candidate has already secured the endorsements of Gristedes owner and talk radio host John Catsimatidis, anti-crime activist and founder of the Guardian Angels Curtis Sliwa and former Brooklyn GOP Chairman and community activist Craig Eaton. Catsimatidis, Sliwa and Eaton also co-chair Capano’s campaign committee.